Treat your employees to a holiday party they’ll never forget at Cranberry Resort Book your next holiday party for an affordable price at beautiful Cranberry Resort in Collingwood. 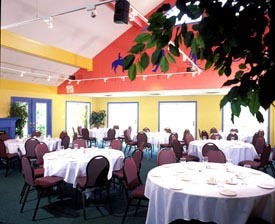 Cranberry Resort offers various deals for the holiday season including buffet style or plated dinner parties, and two charming locations to choose from. Enjoy your very own corporate party at either Bear Estate in the well-appointed William Watts Ball Room, or at the lovely Atoka House, set against the panoramic backdrop of Blue Mountain. For the low price of $34.95, you’ll enjoy a specialty catered dinner, free hors d’oeuvres, fruit punch, late night coffee and delicious Christmas cookies. Cranberry Resort will also be offering the chance for someone at the party to win a grand prize of a one week vacation at Cranberry Resort. If a corporate party isn’t what you’re looking for, Small Businesses from all over Ontario have the chance to come together. There is a special evening available which caters to small businesses, with something for every industry of every kind. You will also have the chance to win a grand prize of a one week vacation at Cranberry Resort at this event as well. The Small Business Christmas party is to be held on Friday November 28th, and Saturday December 6th. You’ll enjoy a delicious Turkey and Roast Beef Dinner Buffet, and then boogie on the dance floor to the beat of Soundscapes d.j. If you book by October 6th, you’ll receive a discounted rate of only $29.95 per person for the evening and only $89.95 for the Accommodation Rate. A fantastic price for a fantastic night! For more information e-mail mwilliams@thecranberryresort.com or give them a call at (705) 445-6600 X 253. Cranberry Resort, set against the panoramic backdrop of Blue Mountain and the beautiful waters of Georgian Bay, is a world-renowned, 750 acre year-round vacation destination. course, full-service marina, fine dining, a luxurious spa and a wide range of outdoor and indoor fun the whole family can take part in. Cranberry Resort is a 4-season vacation paradise!